I have an idea that might help microsoft overtake google for online ad revenue. 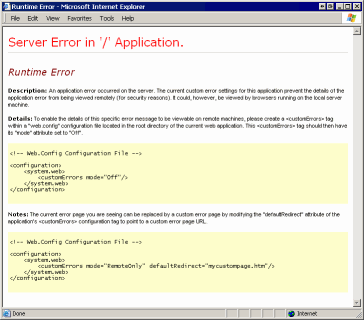 Why not place text-based advertisements on the default 'yellow screen of death' error page that comes with asp.net. Website troubles making you depressed? Change your attitude to life! Website development taking too long? Try Ruby in your browser! I know many companies that would pay a premium to be included on such oft-visited pages. Say there are 100 million asp.net sites, visited 10000 times a day each, erroring just 0.01 percent of the time, that's 100 million impressions per day! Slip a few bugs in the next release of asp.net -- you could easily push it up over a billion impressions per day! I don't ask much. The usual 30% commission will suffice.